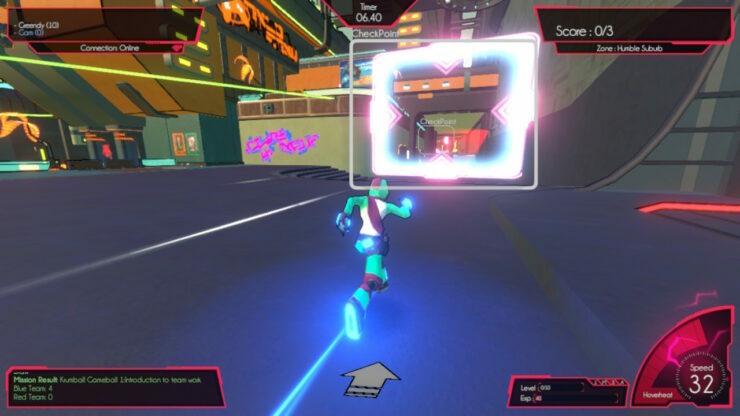 Hover is a game that seems almost like it’s catered for me. It’s bright, colourful and also a parkour game. Well, it’s parkour but in a different way. Different to that of Mirror’s Edge, a series that I still think is criminally underrated. 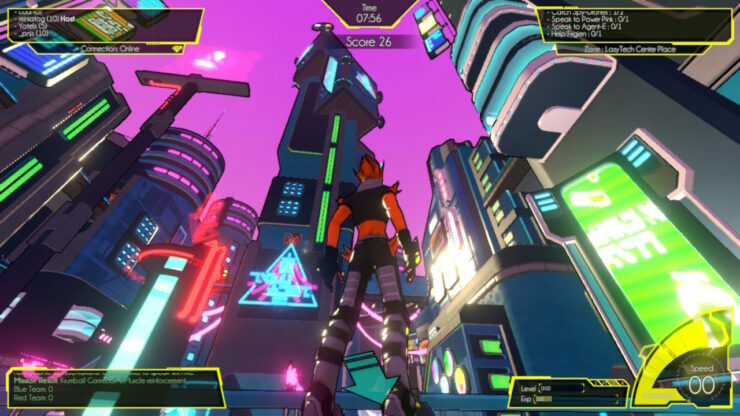 Hover: Revolt of Gamers, as it is fully known, was successfully kickstarted some time ago and is currently out on the PC. It is also coming to the PlayStation 4, Xbox One and the Nintendo Switch on the 18th of September. What Hover does is wear its inspirations on its sleeve. 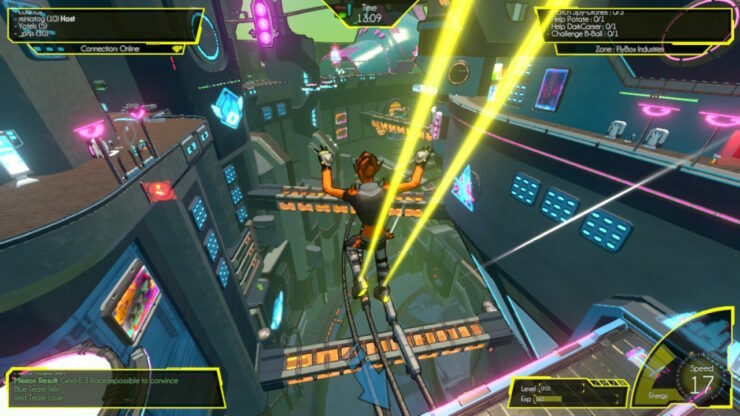 I was outright told that the game is inspired by Jet Set Radio, something that is immediately visible through both the movement within the game and the art style. It’s certainly eye-catching, opting for a cel-shaded, vibrant and generally attractive look. The animations are exaggerated, your character leaves bright streaks behind him or her, it’s engaging to say the least. Just as engaging is the soundtrack. Continuing with the inspiration of Jet Set Radio, the team had Hideki Naganuma (Jet Set Radio) assist with the composition of some tracks. These tracks are equally fast, fitting in perfectly with the pace of the game. It would be easy to argue that the music is as much a part of the world than in a regular title – running, jumping and grinding to the music. During Gamescom, I got to try out the Nintendo Switch version of Hover. I genuinely knew nothing about the game before I tried it. I didn’t have the easiest time with the game, there’s no doubt about that. I don’t currently own a Nintendo Switch, something I plan to remedy within the next few days, which slightly hindered my uptake. It’s a game that certainly tests your reflexes. What I was able to do during my time with Hover was participate in a few races. These seem to be both side missions and core missions. I also got to as spray some graffiti around, which seems very freeform as I could spray anywhere once I’d been taught how. It certainly does wear its inspiration on its sleeves. Possibly the most important aspect of the game is one I was told about, but unable to try due to the location and format I played it on. In addition to being able to single player, you can opt to jump in and out of multiplayer at will. This is something in place on the PC version currently, but the game will be cross-platform. As with other titles featuring cross-platform, PC and PlayStation 4 players are able to play together. Also, PC, Xbox One and Nintendo Switch players are able to play together. I can’t really speak to the longevity of Hover. My hands on was only for around 25-30 minutes. However, I was told that there’s a whole story to go through, as well as a variety of side missions/events. You also unlock other characters, each with their own unique feel, as you move through the game. You are also able to switch between unlocked characters on the fly. Add onto this the multiplayer, where you can drop in and out at any time, challenging yourself against other players. If the Steam page is anything to go by, the game has certainly been well received. 85% of the 910 reviews are positive, which is always a good sign. The move to consoles can only benefit the game, especially as there will be a larger user base to work with for the online mode. That’s why, rather than pop down for the PC version which can be bought now, this is a game I’ll go for on the Switch. Also worth noting is that the developers have made clear that every single feature the switch has available to it, they have used. Hover is a fast-paced, colourful and vibrant game. It looks good on the smaller screen of the Switch. I can understand why the developer I spoke to stated that it is the definitive edition of the game. While I only had a limited time with the game, what I saw certainly caught my eye. There is a bit of a learning curve, but it’s important to know that it’s fun. Now I’ve decided to buy a Switch, this will be a game I buy when it’s released on the 18th of September.